In 1930s Palestine, a Jewish boy named Ygael Gluckstein wrote in a school essay: “It is sad there are no Arab kids in the school.” His furious teacher wrote “Communist!” on the essay. Many years later, when he was the leading revolutionary in Britain, and known as Tony Cliff, he expressed thanks to this teacher for showing him his future career. Gluckstein loved anecdotes like this – funny, but with a sharp political point – and one of the delights of this new book is how it captures all the best stories and jokes. Biographer Ian Birchall believes Cliff's is such an important life that he has devoted 560 pages to it. These are followed by big slabs of bibliography, index, and notes. These academic-style appendices sit oddly with his subject, for Cliff was the most informal of political figures. But overall the book is lucid and absorbing. The detailed apparatus is probably justified by Cliff’s importance for the British and international left, as well as by the author’s own credentials: Birchall is a political veteran who knows where all the bodies are buried. At the same time, his reputation for honesty in presenting embarrassing facts is confirmed in this book, despite his admiration for his subject. It’s not quite “warts and all”, but it’s fairly close. For uncompromising anti-war activity, Gluckstein went to jail for a year, under harsh and repressive conditions. These early experiences say much about the man. He hated injustice (I will always remember him shouting, “Pensioners die of hypothermia – that’s disgusting!”). While he soon learned to fiercely reject actual terrorism as a method of struggle, he displayed considerable flair as a metaphorical political bomb-thrower. At the same time, he was a tireless organisation-builder. And on top of that, he wrote a remarkable number of useful books, though his cut-and-paste style of compiling them made for a certain roughness. Gluckstein moved to Britain after World War II and adopted the Cliff pseudonym because his stateless status made him vulnerable to extradition. He became one of a generation of Trotskyist leaders struggling to apply their departed teacher’s ideas to the post-war period. Many fell into dogma. Clinging to the letter of Trotsky’s teachings, they kept predicting a post-war economic crisis that never came. Cliff, by contrast, quickly grasped that post-war capitalism was set to boom. 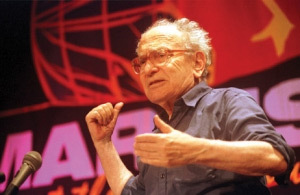 Where most Trotskyist leaders insisted doggedly that the Eastern bloc dictatorships were workers’ states on the road to socialism, Cliff developed a new theory explaining that they were a kind of capitalism – state capitalism. This reclaimed the original Marxist vision of socialism as liberation, in contrast to the common Stalinist politics of the time. For example, much of the left supported the 1956 Soviet invasion of Hungary, and even tried to justify Soviet nuclear weapons. Cliff fought to get rid of both, putting theory into practice. The post-war era was a hard time to build a socialist group. Apart from the sheer survival of his “Socialist Review Group”, Cliff’s greatest accomplishments in these years were ideas; in developing what he called a “troika”, or set of three theories. State capitalism was the most important, but two other related theories analysed the arms economy’s role in the boom, and the way a bureaucracy in third world countries could deflect the “permanent revolution” Trotsky had hoped for. The “troika” were not without flaws, but on balance Cliff’s theories represented a practical and insightful way for socialists trying to understand, and above all, change the post-war world. Successes finally came in the 1960s radicalisation, beginning with gains from the peace movement and activity inside the Labour Party, and continuing with dramatic interventions in the student movement. His organisation, now called the International Socialists, grew dramatically, opening Cliff’s most triumphant years. He co-authored two books on labour movement strategy, one on incomes policy; and another on productivity deals and how to fight them. These sold many thousands of copies and had an undoubted impact on union militants. Meanwhile Cliff was agitating to turn his organisation sharply towards these same militants, trying to pull them into a rank and file movement, which in turn could be the embryo of a mass revolutionary party. Cliff saw major class battles opening up, and unhesitatingly took his place in the front row. Not all his hopes were fulfilled, but the International Socialists did tip the balance towards mass militancy in a number of industrial disputes. And, for a time, a small rank and file movement did make its mark. It didn’t seem so small to the union officials and bosses trying to contain it. The decades that followed were much more difficult. A damaging split in 1974 took important leaders and activists out of the organisation. From Birchall’s account of these times, it is clear that Cliff misjudged some important organisational issues, but we will never get an agreed version of these events – other than that the split was serious and long-remembered. The social climate began moving rightward. In the eighties he made what I would call his last really big contribution. Recognising that society was moving dramatically rightward, and struggles were falling away, he began a fight to convince a whole organisation (now the “Socialist Workers Party”) to move away from unrealistic expectations. Cliff got his way despite considerable resistance, and the party avoided the political train wreck suffered by most of the left. I witnessed some of the later developments in the SWP, and it was clear Cliff’s political bomb-thrower skills had been in play. One issue of Socialist Worker under a new phase of the turn had what struck me as an awkward, abrupt front page. Cliff praised it to me. It was deliberate. This issue was less a paper for the outside world than a dramatic signal to members that big changes were still needed. This sort of exaggerated approach, designed to make a big impact to turn the party around, was what he called “bending the stick”. I didn’t like the exaggeration. But aggressive methods were probably needed to face what became known as the “downturn” of the eighties. Cliff certainly never hesitated. He was fighting tooth and nail to rescue the organisation he’d devoted his life to. His arguments to build the party were not just the stuff of books. In the nineties and after, however, he made some bad calls. He and the SWP – and its international collaborators – exaggerated their successes and opportunities, to the point of distorting their view of the world. Here was the same mistake they had avoided during the “downturn”. The error was embodied in Cliff’s unfortunate claim that the years from 1990 were “the 1930s in slow motion”. The 1930s comparison might have been better saved for the 2007 Global Financial Crisis and its aftermath. The SWP now seems to have corrected these mistakes, well after Cliff’s death. Some weeks ago in London I asked Ian Birchall what he thought Cliff’s legacy was. He found the question difficult. I’ve asked others too, but no one has a ready answer apart from the obvious point that he “built the party”. So here is mine. In the realm of theory, Cliff taught us to value the core ideas of Marxism, in an age where they had almost become submerged. In the realm of practice, he fought for revolutionary action independent of union bureaucrats and opportunist politicians. Neither of these qualities is unique to Cliff, of course, but there is a third leg to my “troika”. Tony Cliff knew how to combine ideas and action, and then explain them in simple, striking examples. In a typically challenging formulation, he called this “raising theory to the level of practice”. It was almost always interesting, and at its best, it was unforgettable. So was his determination. When I was first introduced to Cliff in 1975 as an Australian on my way to Lisbon, he demanded to borrow my passport. So fierce were his eyes it took me a minute to realise he was joking. Being stateless, he couldn’t travel to see the 1974–75 revolution with his own eyes. It must have driven him crazy.